What better way to express your love than through song? 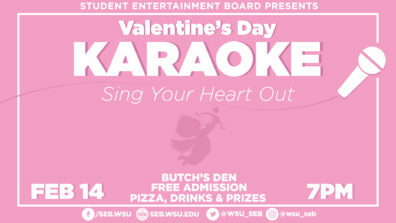 Bring your singing voice and a list of your favorite love (or heartbreak) songs to Butch’s Den for the Valentine’s Day Karaoke Night! Free pizza and drinks provided while supplies last, and attendees will have the chance to win some Valentine’s Day gifts. Invite your friends (or significant other) for a Valentine’s Day to remember!